Thai ladies with a penchant for rock-n-roll were summoned from all parts of the Kingdom to compete in the Miss Hard Rock Pattaya 2014 competition, held August 8-9. 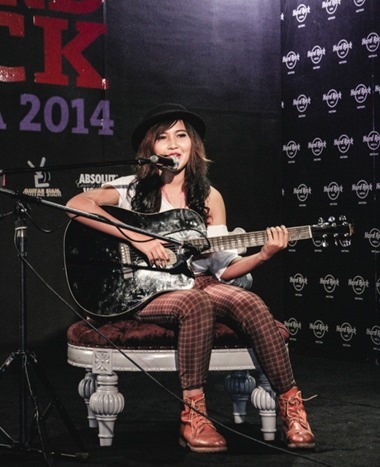 The contest started with the preliminary round on August 8 at Hard Rock Cafe Pattaya. All the participants were asked general questions, which highlighted their musical knowledge and appreciation. After the judges had made their difficult selection decisions, the remaining finalists were invited to stay overnight at the Hard Rock Pattaya and ‘rock on’ to the final round at The Soul Lounge the following day. (From Left-right): Miss Hard Rock Pattaya 2014 winners, Pam (Jirapriya Hemniti), Sandy (Lattawan Tala), Jadzia (Jomkhwuan Khuantakob) and Queenie (Maythavee Noen-U-Rai) celebrate on stage at the conclusion of the contest. The exciting finals day kicked off with in-house band Devotion belting out some classic tunes. Then the contest started, beginning with Your Rock T Style in which the girls showed their creativity by redesigning and decorating a Hard Rock T-shirt. During the event, the audience also voted and elected a worthy winner of the Miss Rock Friendly title, which this year went to Sandy (Lattawan Tala). A break followed, during which Jakkrapan Janchoungchote, the winner of the Hard Rock Pattaya Guitar Festival 2013, performed some amazing guitar solos which wowed the crowd. Finalists strike the pose during the Your Beach Style by Roxy Swimwear round. The contest then continued with a Talent Show, the entrants showcasing their eclectic talents in various styles including vocals, a fusion of northeastern & B-Boy dancing and glamour modeling. Afterwards the ladies showed off their confidence in Your Beach Style by Roxy Swimwear and lastly it was time for the Question & Answer session. After the judges had collaborated and finalized their scores it was time for most exciting moment of the evening when MC Kawee announced the winners and Miss Hard Rock Pattaya 2014, which this year went to Jadzia (Jomkhwuan Khuantakob) together with a cash prize of 144,000 baht. The 1st Runner-up was Queenie (Maythavee Noen-U-Rai) and 2nd Runner-was awarded to Pam (Jirapriya Hemniti). All three ladies will be invited to participate in Hard Rock Hotel & Cafe Pattaya’s events and charity projects throughout the coming year and will also go on to compete against the Bali and Penang finalists in the Miss Hard Rock Southeast Asia contest on 4-6 September 2014 at Hard Rock Hotel Bali, Indonesia. 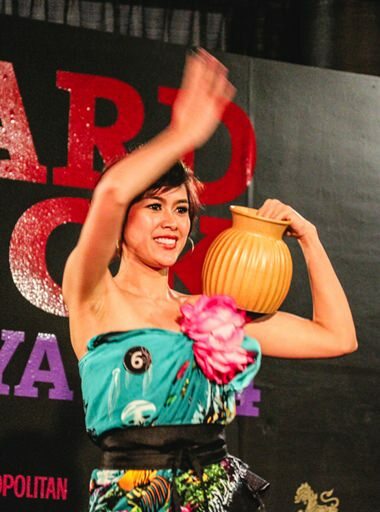 Miss Hard Rock Pattaya 2014 winner Jadzia shows off her northeastern dancing skills. A contestant attempts to wow the judges with her musical talents.